This visually thought-provoking, and slightly addictive post has been brought to you by anchr.co…. If you use the Internet any at all you know how huge images/photos are on the web. It’s the reason sites like Instagram and Pinterest do so well. In fact, I see more images in my Facebook stream then ever before. I think we are so “visual” because most people live such busy lifestyles that we don’t have time to read a lot of text heavy articles, etc. or we don’t have the attention spans to stay interested very long. Whatever the case may be, people are drawn more towards images and videos, nowadays. So I know you’re going to love this new website I discovered recently, anchr.co. The concept behind anchr is to use images to ask questions. 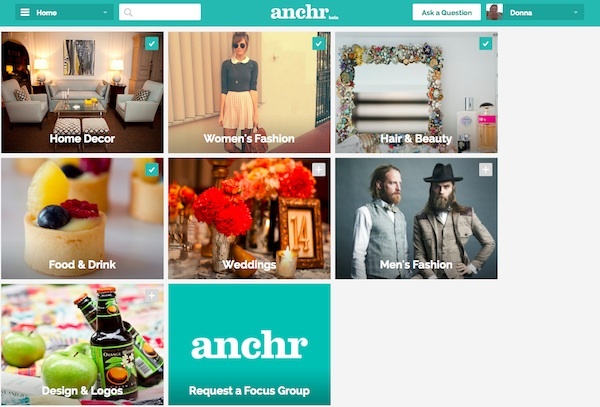 Anchr is a community for asking and answering visual questions on topics you love. Explore trends and see how your tastes compare across visually driven Focus Groups. 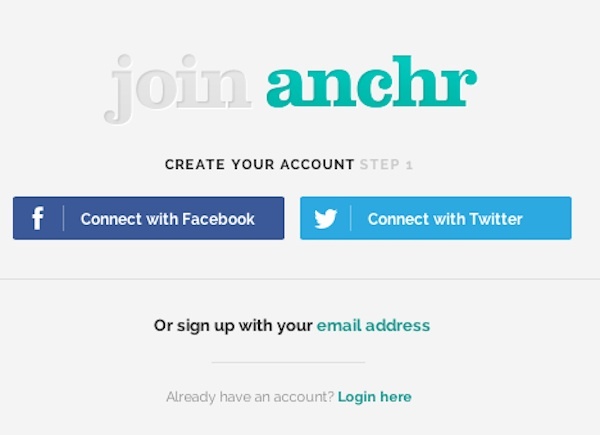 It is so easy to join the Anchr community — either using your email or even simpler, use your Facebook or Twitter to sign up. They have a great mobile site to make it easy to access on the go, and nice apps like the ‘Anchr it” button for your browser. I uploaded it to my toolbar and now I can ‘anchr’ a pic from any page on the internet with just one click! I literally was able to ask a question in a minute. I am an avid reader and lover of books, so my dream library would look like the one in the above image. 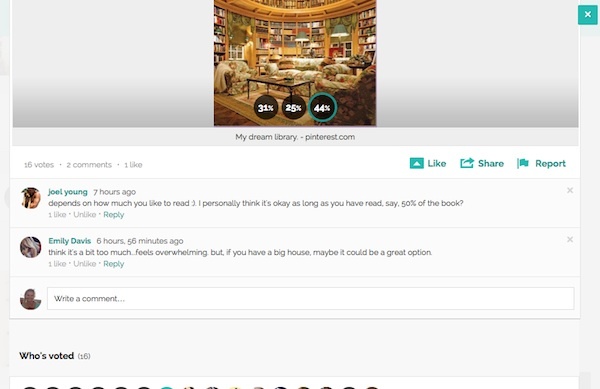 I asked the question “Your dream library or too over the top?” It seems that the majority so far think my dream library is too over the top. Maybe you’re planning on redoing your kitchen and can’t decide on what color scheme to use, you can find the photos of kitchens you like and get opinions/advice from the anchr community to aid you in your decision. Or, if you’ve redone your kitchen already you can upload your photo and ask others if they like it. Want some advice about what kind of look to wear to a special occasion? Or which outfit would work best for a job interview? Ask your question in the Women’s fashion focus group. Need advice about an updo to wear to a wedding? Or the perfect shade of lipstick? Ask away. Can’t decide on a particular recipe to try? Find some answers in the Food & Drink focus group. I’m already married, but I can see HUGE potential with the Weddings focus group. If you can’t decide what kind of flowers to use, or which cake you want, or even on your wedding dress… you can ask all your wedding questions here and get help making your decisions. Okay guys, they didn’t leave you out. There’s a section for you to ask all your questions, too. There’s even a focus group for design and logos… perfect for graphic artists/designers, as well as for companies and brands. You can also request a focus group. I could see a “Travel”, “Pets”, and “Arts & Crafts” focus group doing quite well, if I do say so myself. It’s free to join! I’d love it if you would follow me on anchr here and help me with questions. I know I can’t wait to see what questions you have! I will have to check this program out. It might be the next biggest social media platform, never know. 🙂 Thank you for sharing Donna. That looks pretty awesome. I don’t know how I am going to keep up with all of these social networks now. What a great program! So many fun things to do! Sounds like an interesting community and you can do pretty much anything with a photo. You had me at visual. I’m a visual learner and have a touch of ADD so I need Anchr! Although the thought of learning anything else social media related makes me want to ball up in the corner, I have to admit this is kinda neat. Hoping over to anchr right now to check it out. Thanks for sharing. Similar to Pinterest but it is interesting that you can have questions answered. Will have to check it out. I have never heard of this! Sounds like something I need to check out! Sounds like an interesting concept. I can see why you love it. I’m heavily into home decor and I love the idea of being able to ask others if they’refeeling the look or not. I’ll definitely check it out today! Oh my, I can see myself spending hours on this site. How fun is that! And your dream library is most definitely NOT over the top…lol! Love it. Thanks for posting. I’m definitely gonna go check this out. this is really a great progrm! This looks like fun for random polling, but I really don’t want to crowdsource opinions on important topics! That looks fun! I am definitely a very visual person. &I love that library! It is definitely a neat concept, just don’t know how many more social media networks I can handle. I really like this platform and I need to check this out to see what I can do with it. It sounds like a site that I can really use to help me! This looks really neat. I hadn’t heard of it before now. interesting, I’ve never heard of it before. Wow, it really is fun! I’m a pretty visual person as well so I think I would like this.